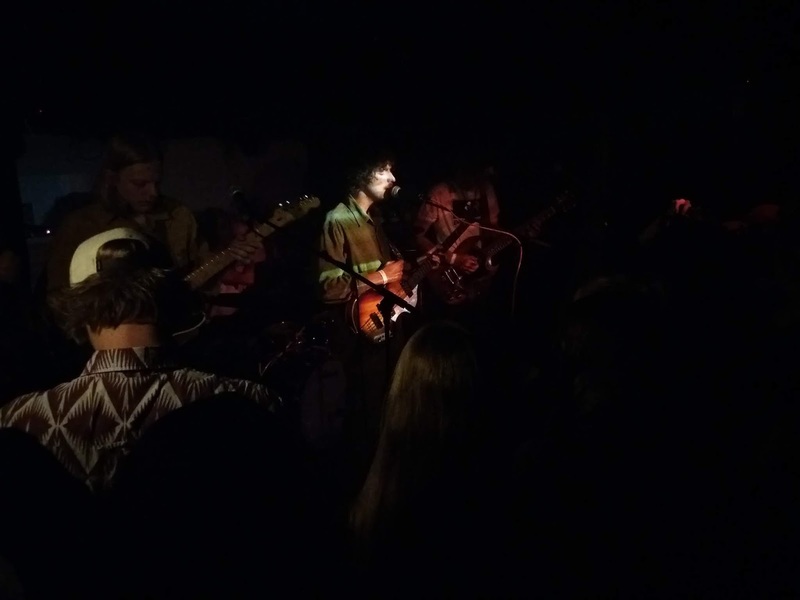 Following that extremely enjoyable album released by Jellephant, 'Skeletons', last week, I was able to attend the cd presentation show in Amsterdam. 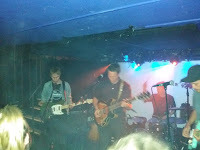 Together with a band called Poncho, also presenting a new release. While listening to the album working towards my review (read on here: http://wonomagazine.blogspot.nl/2018/05/skeletons-jellephant.html) I couldn't get my mind around what band the opening song reminded me of. Listening in the train to Amsterdam I knew it at the second note: The Dandy Warhols. Funny how thing can go. Mystery solved. Arriving, I soon had the idea that I was attending a high school party, 40 years late. "Ah, there come the parents", I thought. Now Jellephant is from Arnhem, so the kids and parents must have come for Poncho. It wasn't hard picking out some of the members, the way they welcomed or were approached by all their friends. It was apparent Jellephant was not playing a home gig. I simply have to own up that it is not easy to write something positive on Jellephant and the Phantoms. On the show and presentation that is. Not that they cannot play, not that they do not have the songs, not that they were playing badly. There's no beating around the bush on these pages. Jelle, you are the front man. You are Jellephant. So it does not do to put someone else in your place on stage. It does not do to stand in the dark for most of the time. It may feel safe, but it doesn't help the show, the feel and the conviction a band needs to take on nor to establish interaction with an audience. Especially one that is not yours in the first place and needs to be conquered, skin and bones. Neither does a microphone drenched in bathroom vibes, making it nearly impossible to understand what you are saying when you do address us. A second mike would help here. Musically all was alright. I can still call up some of the licks I heard, in my mind easily. The three guitarists all played different parts on different ends of the guitar neck, creating a wealth of sound together. There was so much detail in the layered music Jellephant created this way. The music is fun, so much more so than what followed. I saw a crowd go wild on Poncho's music. Music that never touched me, personally. On the other hand I saw musicians communicating with their audience and making them wilder. Yes, they might have been playing to people from their schools, friends from the streets they live in, relatives and soccer mates, each and every one of them was made to feel special. And that is where successful bands start out. Poncho needs to get better and I am sure they know it themselves. Accidentally overhearing the intention to start playing as much as possible soon, I can only add smart move. If Poncho can address and attract other audiences the way they did this audience tonight, the question only is: where will it end? 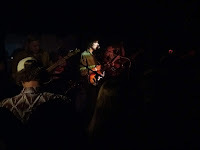 Musically, I heard disco rhythms mixed with psychedelic sounds, punkrock creating moshpits at the end of the show, attempts at balladry sort of Indian Askin style and what not. It wasn't my kind of thing, yet it was a show. A show the audience really dug and the energy bounced right back and back again. 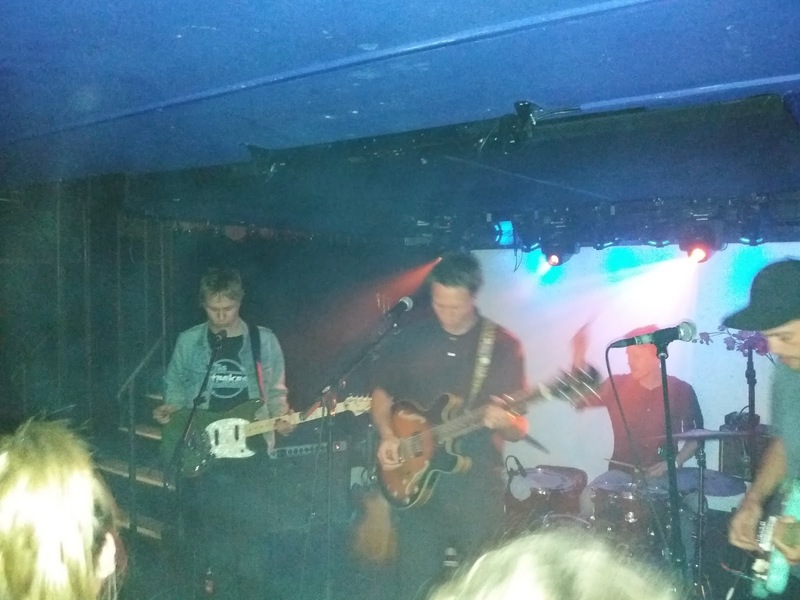 The shoegazing elements in Jellephant's music do not lend itself for such jollity, yet just a few small elements, now missing, could spark its show as well. There is something to learn here. From the basement to a stage is a giant leap at this point in time. You have the music, so use it to your advantage. A wave, a smile, a nod and "hello, how are you? ", in light, may go a long way for starters. "For you, me, everybody, everybody", to quote the über showmeisters The Blues Brothers.